Too artificial and "spicy" to be well rounded. Just so you know. I went to Sonic’s to try the pumpkin pie milkshake which of course is available for a limited time, along with their new Kickin’ Coney and Bacon and Bleu hotdog. I had a previous run in with a pumpkin flavored dessert that left me dazed, hurt and disappointed. Actually, I’ll name names 🙂 Edy’s pumpkin pie ice cream is overly artificial in flavor, with too much focus on the sweet with poor traces of spice. And the spice that IS there tastes off balanced. Too cinnamoney to me. I was not a fan at all…Now, I know some of you are going to say “Duh, it’s ice cream. What did you expect?” Certainly not that frozen weirdness I tasted. Apparently, Sonic understands what I mean. Why? because their pumpkin pie flavored milkshake is amazing; it has lovely layers of rich pumpkin flavor that delicately infuses traces of cinnamon nutmeg that do not over power the pumpkin flavoring. I took a pic, but it got deleted, so I borrowed this one. The texture is rich, creamy, and thick, like regular Sonic shakes are. There is an earthy depth to the shake, as the first sip is laden with ripe, sweet pumpkin that doesn’t scare the taste buds. Then, there is a warm undertone of cinnamon and nutmeg that add a well rounded feature to it. I felt this milkshake aptly used fall flavors of pumpkin and spice to make for a fun and sweet shake- and I feel it’s very easy to mess up frozen pumpkin type desserts by over using spiciness. I got a medium for $2.29. I wouldn’t recommend it for diabetics. Again this is fast food, so it’s not for the health conscious who are concerned with calories, fat or sugar. According to their site,the calorie content is 710. Wow. 78 g sugar, 9 g protein, and 1 g of fiber. But hey, there’s 0 g trans fat! 😀 And that’s the best of it with nutrition, folks, bt what do you expect? it’s a milkshake from Sonics! Pumpkin Pie Shake Yumfactor: 5 tongues!! (5 out of 5 stars) I think this is flawless, and I have a friend who is scared of pumpkin flavored drinks and she agreed that is was rich, true to pumpkin pie goodness and yummy. 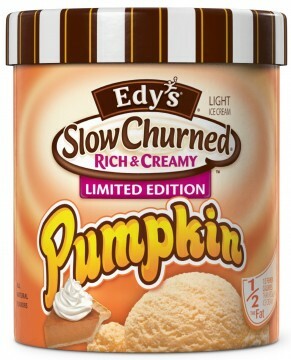 Edy’s Pumpkin Pie Ice Cream Yumfactor: 2 tongues and a tastebud. (2.5 out of 5 stars) I wanted to like it, but it was not well balanced in flavor. I like the color though, so I added an extra “.5” 😀 It is “light” so perhaps the lack of extra fat manifests itself in the way it tastes. What are your thoughts? Rate. Comment. Subscribe. « Must Try Food: Honey BBQ Cheeto Puffs. Hi Janet! I’m glad to see someone loves it as much as I do! There no more being sold!? Seriously?! That’s sad. The last time I indulged was a few weeks ago. I think I’m gonna cry! :-S Thanks for reading and commenting! Have a great day. P.S> Pop tarts makes a pumpkin spice flavored pop tart and it’s pretty good. I will do a review soon. Hey Helen! Thanks for stopping by and feel free to suggest any topics you may feel I should review in the future! Have a great day!